Mats Gustafsson (sax), Ingebright Håker Flaten (bassi), Paal Nilssen-Love (trommur). Tónlist “The Thing” hefur verið lýst sem bílskúrsjazzi og spunapönki, enda áhrifin jafnt komin jafnt úr framúrstefnurokki, jazzi og pönki auk allskonar hliðarverkana úr bæði hávaða og hljóði. Tríóið var stofnað vorið 2000 og er meðal afkastamestu fríjazzhljómsveita heimsins í dag. Tónleikar þeirra fara fram úti um allan heim og listi samverkafólksins er ekki síður fjölbreyttur; Joe McPhee, Ken Wandermark. Otomo Yoshihide, Jim O’Rourke, Thurston Moore, Terrie Ex, Peter Evans og Neneh Cherry. “Þegar þessir þrír kúpla sig upp í efsta gír er í raun enginn sem kemst nálægt þeim heimsendaákafa sem frá þeim stafar” (Jazzwise). 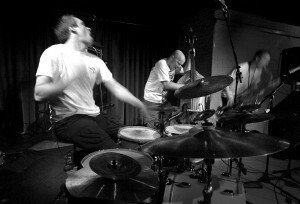 Mixing jazz with noise, avant-rock and punk, the music of The Thing has been described ‘garage-jazz’ and ‘impro-punk’. The band was established in the spring of 2000 and has grown into one of the most successful and hardest working free jazz trio’s around, traveling all over the world. They have performed with guests like Joe McPhee, Ken Vandermark, Otomo Yoshihide, Jim O’Rourke, Thurston Moore, Terrie Ex, Peter Evans and Neneh Cherry. “When these three move up into the highest gears, there’s really no one who comes close to their full-on, end-of-the-world energy “(Jazzwise).